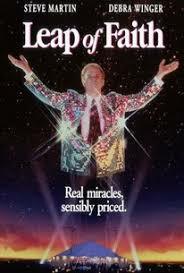 The 1992 comedy drama, Leap of Faith, starring Steve Martin, Debra Winger and Liam Neeson, now available for streaming on Amazon Prime, is worth a revisit amidst the growing number of nauseously made current films that try to pass as faith based. And even though Leap of Faith does not try to pose as a Christian film, it nevertheless makes the grade far better without false marketing pretense that caters to poorly made movies that fluff out the choices found on venues such as PureFlix.com. In this movie, Steve Martin shows both his comedic and pragmatic side with equal magnitude, starring as Jack Newton a.k.a. Jonas Nightengale as a Brother Love's Travelling Salvation Show huckster born in the Bronx and abandoned to a hardscrabble life of con games and crime. Debra Winger plays Jane, his front person behind the scenes who sets up "miracles" and other well known mentalist con artist tricks that let them roam the Deep South making a comfortable living on gullible believers along with his sizable church posse which includes Meat Loaf as bus driver. He packs revival meetings with an impressive array of charismatic black choirs, stunning stage effects and other gimmicks that, as he says to Liam Neeson, the skeptical sheriff of fictional Rustwater, Kansas, "sells hope to his victims more than an expensive Broadway show". Because of a truck breakdown in drought stricken and struggling, farm town Rustwater, Martin takes the opportunity to turn a quick dollar even though the population is nearly broke and praying desperately for rain soon for their corn crops which they pin their last economic hopes on. But he ends up getting more than the usual push back and reaction when a boy named Boyd, played by Lukas Haas, looks to Martin for healing after being crippled in a deadly auto accident which also orphaned him. By the end of the story, Jonas Nightengale, after an amazing turn of unexpected events, throws in the towel and leaves Rustwater on his own, hitching a ride from a trucker with one last spectacular miracle for the road. The reason I call this film more Christian themed than many others is because it is not packed with sloppy sentimentalism and covered in a thinly coated veneer of questionable evangelical doctrine. It shows truth in life as only the cinema and great acting can do, not covering the warts of sinners nor saints. Indeed, Winger smirks at Martin's attempt to hit on Boyd's pretty, older sister, saying that for him she's just the "holy grail of road p**sy". Ultimately, what compels the viewer is the providential power of surprise that plays out in the film near the end and testifies to the fact that the good Lord can and does use all circumstances for His glory if He chooses to do so in spite of our bad intentions. Let the unveliever beware: miracles are forthcoming.